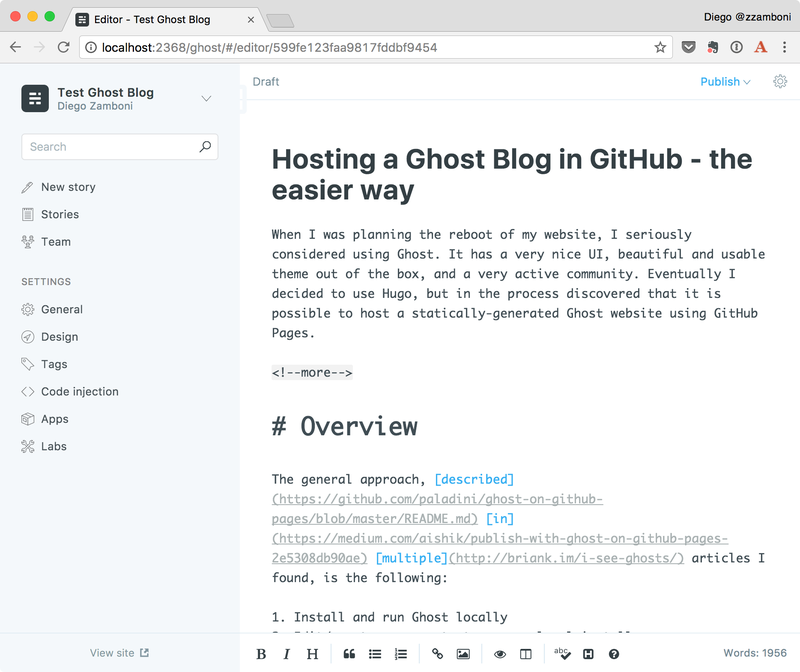 Create a static copy of your Ghost site by scraping it off the local install. So far, so good. It makes sense. But all those articles share one thing: they suggest using a tool called buster which, as far as I can tell, it’s a web-scraping tool, specialized for Ghost. However, it has a number limitations–for example, it does not slurp Ghost static pages, and it hasn’t been updated in a very long time (there’s a fork with somewhat more recent activity). I found the use of buster puzzling, since there is a perfectly mature, functional and complete tool for scraping off a copy of a website: good old trusty wget. It is included (or easily available) in most Unix/Linux distributions, it is extremely powerful, and has features that make it really easy to create a local, working copy of a website (including proper translation of URLs). I used it to create the static archive of my old blog, BrT, when I decided to retire its WordPress backend years ago. Another thing I found is that most instructions suggest storing only the generated website in your GitHub repository. I prefer keeping the source files and the generated website together. 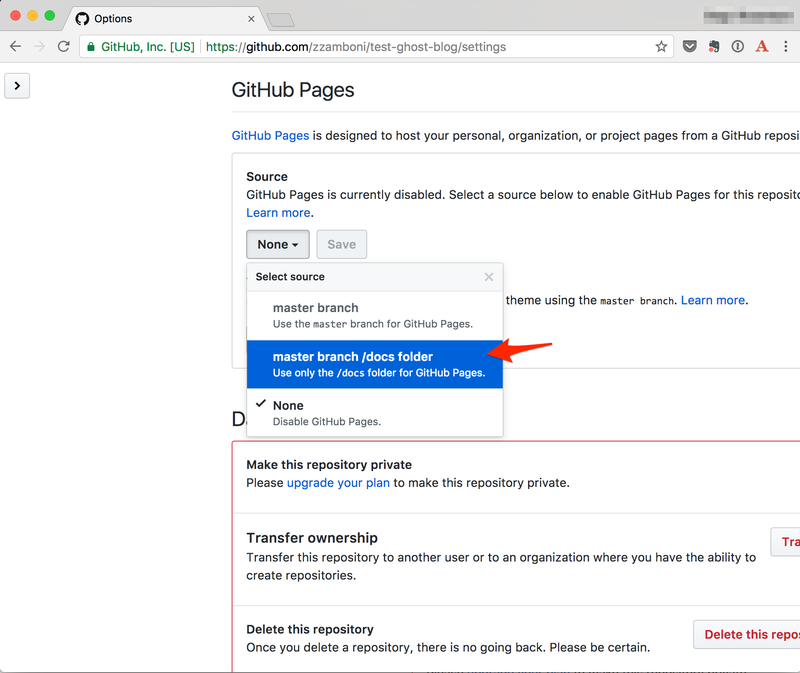 GitHub pages allows serving the website from different sources, including the repo’s gh-pages branch, its master branch, or the /docs directory in the master branch. Personally, I prefer using the /docs directory since it allows me to keep both the source and the generated website in the same place, without any branch fiddling. So, without further ado, here are the detailed instructions. I ran these on my Mac, but most of them should work equally well on Linux or any other Unix-like system. You may want to use an email address you don’t mind being public. See “Security Considerations” below. Now that you have your blog set up locally, we need to generate a static copy that can be published to GitHub. For this we will use the wget command. I gathered the correct options from this blog post by Ilya a few years ago, although it’s not too hard to deduct them from the wget man page. This command will crawl the entire site and create a static copy of it under the docs directory. You can open the file docs/index.html in your web browser to verify. We can finally create our GitHub repo and push the contents to it. Now all we need to do is enable GitHub Pages on our repository, so that the contents under docs gets published. Connect to http://localhost:2368/ and update your contents. You can also change the blog settings, themes, etc. If your repository is named <username>.github.io, you cannot configure GitHub Pages to serve content from the /docs directory, it is automatically served from the root directory of the master branch. In this case you need to store only the generated pages in the repository (you could also reverse the setup: have the generated website in the root directory, and the local Ghost install under the /source directory). You can choose to serve contents from the gh-pages branch instead of the /docs directory. This allows you to keep the source and output still in the same repository. You will need to switch from one branch to the other between updating the contents and generating the static web site (you may need to keep both branches in different directories, so that your local Ghost install can still access its database in the master branch while you fetch it to generate the static website). You can read more about the different ways to serve GitHub Pages content in the GitHub documentation. And of course, you can use the same method to host your static content somewhere other than GitHub pages. One of the most-touted benefits of a static website (also known, I discovered recently, as the JAMstack) is security – without server-side active components, it’s much harder for a website to be compromised. 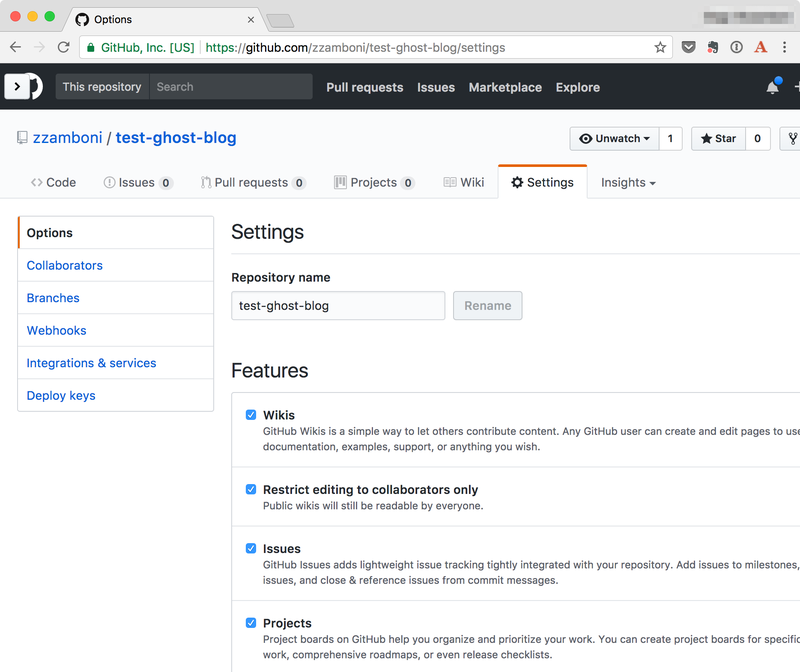 Sharp-eyed readers may have noticed that with the setup described above, Ghost’s entire database file gets checked into your repository. This file contains not only your published blog posts, but also your user definitions (including hashed versions of the user passwords) and draft posts. Your name and email address are accessible. Your name is visible in any posts you write, but you may want to set your email address to one you don’t mind being public. Don’t use a password that you also use in any other place (this is a good security recommendation in general). The password is hashed, but this prevents the password from being useful even if someone manages to figure it out. If you share your machine with others, keep in mind that any other local users will be able to access your local Ghost install as long as it’s running. If you don’t trust those users, make sure you set a good password and shut it down when you are not using it. If you are really worried, add content/data/ghost-dev.db to your .gitignore file so it does not get checked into the repository. Make sure you make a backup of it separately so you can recover your blog in case of local data loss. 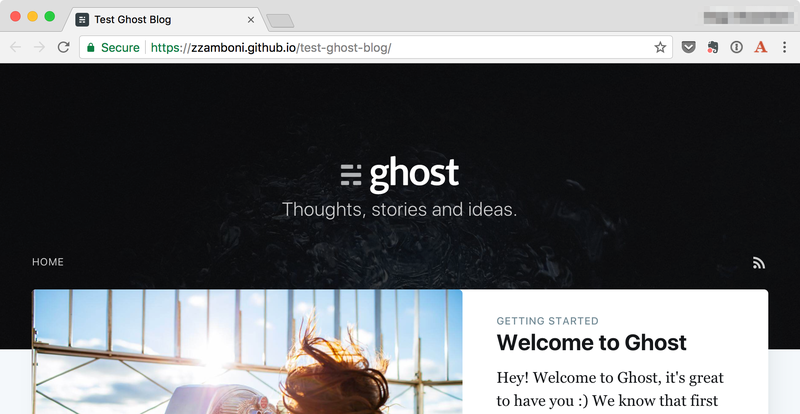 I followed the steps described above to create a test Ghost install, which you can access at https://zzamboni.github.io/test-ghost-blog/, and its corresponding GitHub repository at https://github.com/zzamboni/test-ghost-blog/. You can also find this article published there. I hope you’ve found it useful. I’d love to hear your comments!